Chapbooks Eleven different chapbooks for each of the eleven different texts we have written were created and provided for the audience. Feedback Session An hour feedback session followed the performance. Blue painter’s tape lines echoed the overhead lighting grid on the floor. Seven interconnecting “rooms” were designed within this grid. “Doors” between room were designated with yellow painter’s tape. Through Chance Operations the rooms were assigned one of the Seven Significant Words. Internet derived definitions of each of the Seven Words were written on thin plastic dropcloths. Tables from our internet brainstorming sessions with words free-associated from each of the Seven Words were transcribed by hand to easel pad sheets. Each of the Seven Texts that were created during earlier sessions were transcribed to long rolls of paper. “Walls” between rooms were sparsely indicated by hanging the plastic drop cloth and easel pads at different heights from the grid in their Word-designated room. The Text Scrolls were both hung and affixed to the floor along the “walls”. An L-shaped “fence” with thick plastic pockets, each filled with words cut from the paper and objects that related somehow to the Seven Words, demarked a “wall” near the entrance to the Black Box Theatre. 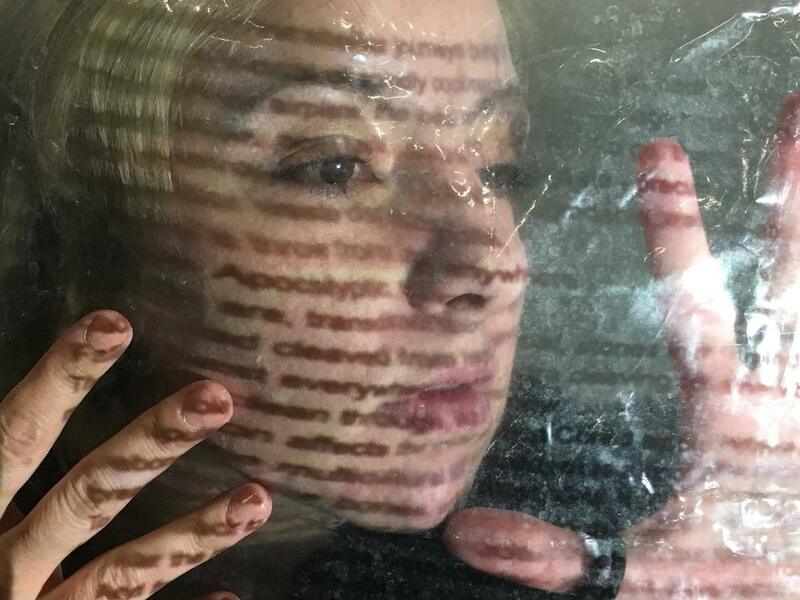 Four video projectors were positioned to have their images fracture through the plastic and onto the paper. 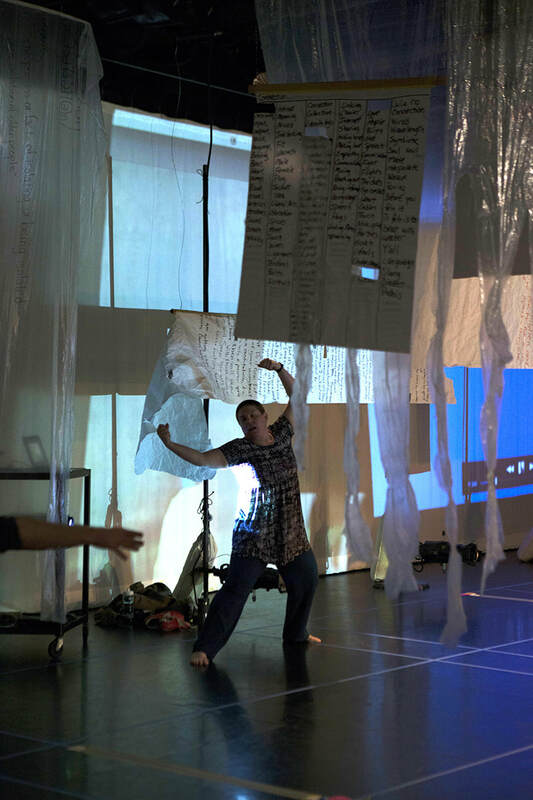 Throughout the installation they projected edited videos culled from our Hangout Live sessions, images created by collaborators inspired by the Seven Words and a randomized projection of free-associated words contributed by the audience as they attended the performance/installation. During our internet sessions we free-associated words from each of the original Seven Words. From these lists each of the eight collaborators selected four meaningful words associated with each of the Seven Words. Each collaborator utilized these meaningful words as prompts incorporated within a stanza of writing combined with the other collaborators’ output to create seven different collaboratively written texts corresponding to each of the Seven Words. The Staged Reading was in seven sections. The order, content and structure of each section was determined through aleatoric means. A roll of virtual dice determined which of the Seven Words Texts would be utilized; the order, number and identity of stanzas; and whether electronically- manipulated recorded versions of us reading the stanzas would be incorporated. Stanzas were performed by the original writers within the ‘room’ corresponding to the Seven Word that inspired the original text. To write the EQ 1-4 texts during our internet sessions, four lists of 56 words drawn from the eight collaborators’ seven sets of four meaningful words were created: EQ 1 utilized the first meaningful word for each of the Seven Words by all eight collaborators, EQ 2 utilized the second meaningful word, and so on. In Google Docs we simultaneously performed a variation of the Surrealist ‘Exquisite Corpse’ game. The 56 words had to be incorporated within the text and had to be kept in the same order as presented in the original list. However, we were free to write and edit anywhere within the text, oftentimes changing the meaning and intent of what another collaborator was in the process of writing. Once each EQ text was complete, each collaborator selected seven words from each text. 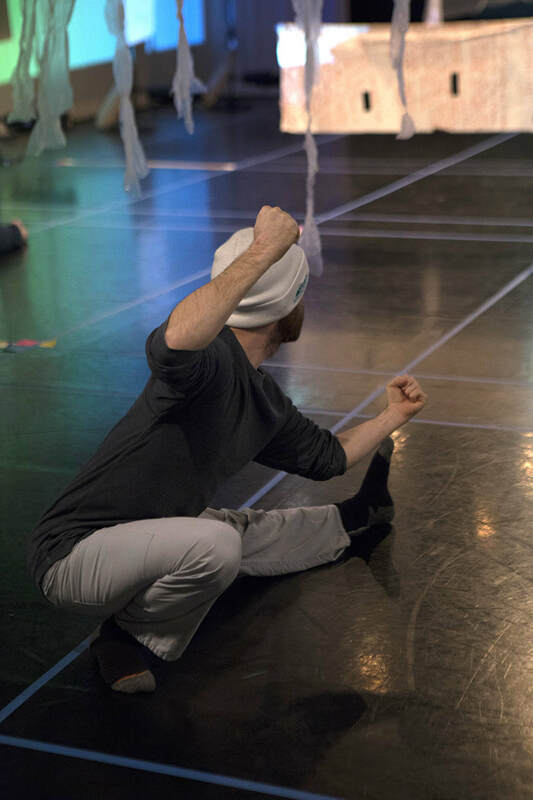 These words were then combined with four movement prompt words to provide a choreographic rubric for each performer to create a seven-part EQ movement phrase. An augmented 14 movement EQ+ phrase was then developed by incorporating one movement for each of our fellow collaborators’ phrases within our original phrase. The rubrics for the original EQ movement phrases were then utilized to prompt seven section sound scores created by each collaborator. By a roll of virtual dice it was determined that EQ2+ phrases would be performed simultaneously by all collaborators. The die also determined which ‘room’ each collaborator would perform. Logan utilized the EQ sound scores as source material for improvised musical accompaniment. 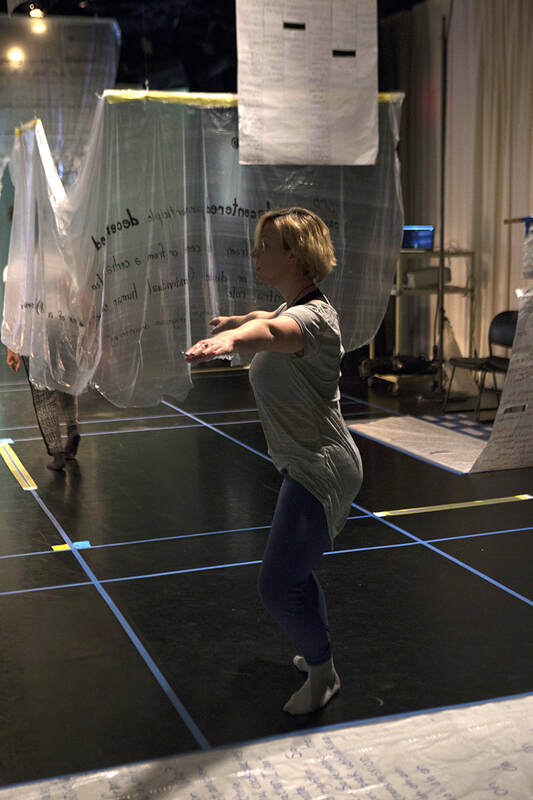 EQ 3 text and movement was performed sequentially in seven sections. 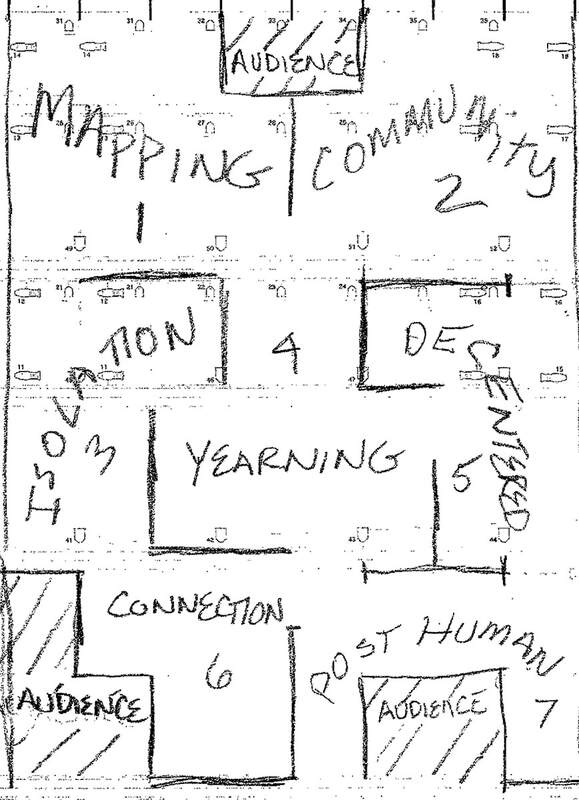 By roll of virtual dice it was determined: how many and which rooms would be utilized; whether text only, movement only, or text and movement would be performed in each room; how many and which collaborators performed. Logan improvised cello accompaniment while traveling to various ‘rooms’ in the installation. Virtually Real: the isolated connection community was supported by a generous grant from Florida State University’s Council of of Research and Creative Activity, we are grateful to the School of Dance for their generous in-kind donation of the beautiful spaces of Montgomery Hall to structure this work, allowing us to gather to play in real space in real time, some of us meeting face to face for the first time.